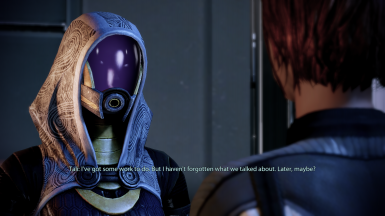 This mod allows Tali and Thane to be romanced by both male and female Shepard, utilizing unused dialogue in the game files. 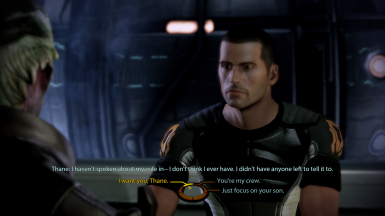 It also fixes issues with imported same-gender Ashley and Kaidan romances and allows and restores other same-gender content whenever possible. - Garrus will now turn down FemShep if she flirts with him after locking-in with Tali. 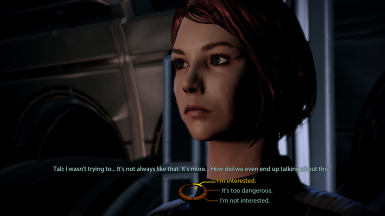 - FemShep's flirty "I'm more interested in just talking for a bit" line towards Jacob will now only occur if he is being romanced. 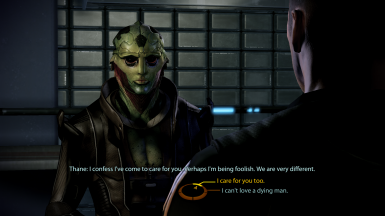 - Removed an unvoiced line of dialogue regarding a MaleShep/Thane romance during Liara's Normandy visit in LotSB. 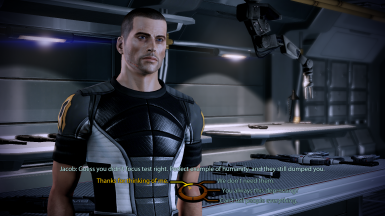 - Fixed animation issues in Thane's lock-in conversation and Jacob's third conversation on the Normandy. - Added compatibility patch for the Genesis DLC. - Removed the BioD_Exp1Lvl5_200Cabin_LOC_int.pcc file, since it was causing the game to crash when inviting Liara to the Normandy in LotSB. 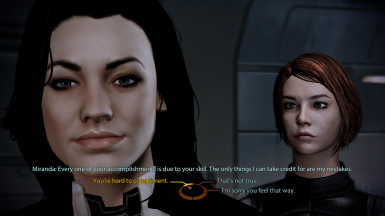 ﻿Both male and female Shepard can now flirt with Tali and Thane and pursue romances with them. 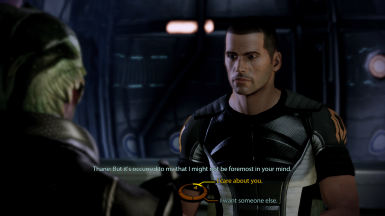 Imported same-gender romances with Ashley or Kaidan are now properly recognized in certain scenes and dialogue. 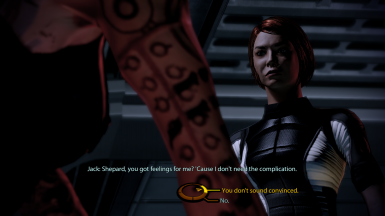 FemShep can have a fling with Jack and receive a kiss from Gianna Parasini. Some flirts with Miranda and Jacob are now available for both Shepards. 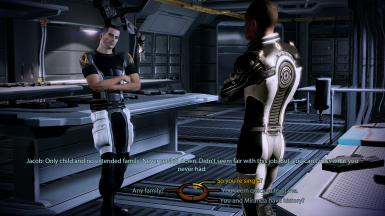 Ashley and Kaidan can now be chosen as love interests in new playthroughs regardless of gender using the Genesis DLC. Erik JS' DLL Patcher must be installed in order for this mod to function. The mod is also only available for the English localization. This mod is not compatible with ME2Recalibrated. 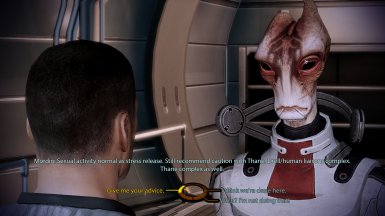 Imported playthroughs that use this mod are not compatible with any of Giftfish's mods for Mass Effect 3. Some dialogue and scenes will not occur for same-gender Tali and Thane romances, due to animation issues and/or lack of audio. 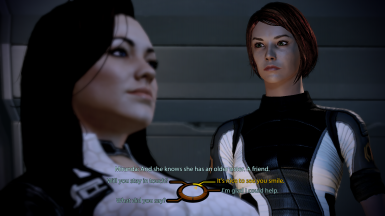 As a result, there is no romance scene between MaleShep and Thane, some of Tali's romance-specific conversations won't occur for FemShep, and it is impossible to break up with either of them after the romance is locked-in. If you are using Origin, make sure automatic game updates are disabled through Origin's settings. 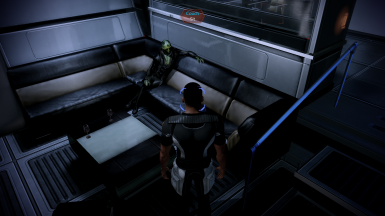 Copy the downloaded DLC_MOD_SameGender folder to BioGame\DLC\ within your Mass Effect 2 installation directory. If you have the Genesis DLC installed, copy the .pcc files from the Compatibility Patch for Genesis DLC folder to DLC_MOD_SameGender\CookedPC\. 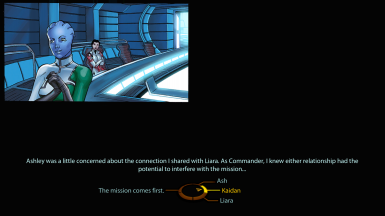 Same-Gender Romances for ME3 - Fixes issues with imported same-gender romances with Ashley, Kaidan, Tali, and Thane. Thank you to the ME3Explorer team, as this mod would not exist without their tools.